FILE - Anti-government demonstrators wave a Venezuelan flag during a protest against President Nicolas Maduro in Caracas, Aug. 12, 2017. Demonstrators gathered outside Venezuela's National Intelligence Service headquarters this week to demand the release, or at least better treatment, of several hundred dissidents detained there and elsewhere for months. Adriana Pichardo was among several lawmakers in the opposition-controlled National Assembly joining a dozen activists at the site Wednesday. She said detainees' family members had complained to her of inhumane conditions, with detainees sometimes kept in isolation, subjected to other harsh treatment and exposed to contagious ailments. One political prisoner "died a few days ago of tuberculosis. All our prisoners are exposed," Pichardo said, adding that she'd heard the mite-borne skin rash scabies also was rampant among detainees. 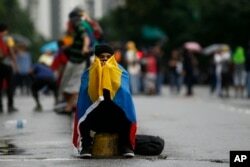 Venezuelan authorities have not provided information on the alleged death and VOA could not independently confirm it. The Venezuelan Penal Forum reported in September that 45 political prisoners, some in fragile health, needed but were not receiving medical care. FILE - A masked anti-government protester, with a Venezuelan national flag wrapped around him, sits on the edge of a median strip in Caracas, Venezuela, June 28, 2017. 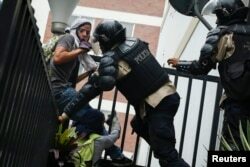 The Penal Forum, a nongovernmental organization, estimates President Nicolás Maduro's socialist government has 380 political prisoners in custody after detaining thousands in turbulent street protests occurring almost daily from April through July. Many are thought to be held by secret police at the intelligence building. The detainees "are primarily students," though they include "political leaders, social activists, police, military," said Teodoro Campos, vice president of the parliament's human rights commission. Demonstrator Adolfo Baduel said his imprisoned father, military General Raúl Baduel, had been "tortured," enduring extreme sleep deprivation and isolation. The elder Baduel had been an ally of Maduro's predecessor, Hugo Chávez. Campos reiterated a call for justice, stressing that many civilians had been denied due process and tried by military tribunals. The U.N. human rights office reported in August that it had urged Venezuela's government to halt the "systematic detention" of protesters and to end the "growing use of military tribunals to try civilians." The office's website said such tribunals had heard the cases of at least 400 protesters, with "the vast majority" convicted and confined for "crimes in the military justice code, such as rebellion, treason and assault." Delcy Rodríguez, president of Venezuela's new pro-government Constituent Assembly, which is revising the constitution and asserting power over the National Assembly, discounted such complaints of injustice. "When we have to listen to the testimonies of relatives who lost a loved one in the violence unleashed by the Venezuelan right, it seems incredible," Rodríguez responded from her federal office Wednesday. Last week, the European Union awarded its Sakharov Prize for human rights to Venezuela's democratic opposition and political prisoners. Venezuela's national police detain anti-government protesters during a protest against President Nicolas Maduro's government in Caracas May 8, 2014. Wednesday's demonstration at the intelligence building came a day after hundreds of protesters marched to the Caracas offices of the Organization of American States, where they delivered a document endorsing OAS Secretary-General Luis Almagro's efforts to uphold the country's flagging democracy. The document bore the signatures of 45,000 supporters. Almagro has goaded the international community to pressure Venezuelan government authorities to restore democratic norms, including freeing political prisoners and allowing humanitarian aid to offset severe shortages of food and medicine. Activist Lilian Tintori, whose husband, Leopoldo López, is a political prisoner under house arrest, acknowledged efforts by the OAS, the United States and many other countries to try to peacefully resolve the crisis. Tintori called for sustained international attention and action. "Human rights have no border," Tintori said. "When there is a systematic violation of human rights in a country, the entire region has an obligation to do something."